Ahh, CES. Where tech hearts are swollen with possibility then broken on the nasty sharp rocks of reality. We took to Twitter to see what everyone's making of CES 2013, year of the, er, portable media storage and LG's continued dominance in front-load laundry. First the venue: the CES roadshow has rolled back into Vegas where, as @robotodd revealed, you can get married next to a Pizza Hut. Ah, romance. Anyway, on with the tech. Those reading @edzitron's tweets would go expecting big things. He's all roll-up, roll-up: "Y'ALL WANNA LOOK AT SOME ELEXTRONICS COME ON DOWN TO CES WE GOT 8K TVS WE GOT PHOBLETS WE GOT WIFI GERBILS WE GOT USB TROUT". Which reminds us, we really do need to get out phoblet playing nice with the Wi-Fi gerbil we picked up yesterday. The reality of CES 2013 is slightly less interest-piquing. LG's press conference caused the opposite of a stir as it failed to announce much of anything at all, other than that it will launch a Tier One phone… at MWC. MSN Tech's @paullamkin lamented, "LG press conference confirmed what we all suspected. No one is gonna do a high profile mobile launch at CES. Roll on MWC…"
Although Sony did unveil the Xperia Z a few hours later, there has still been a dearth of interesting phone news. "Boring Samsung press conference compared to previous. Cheesy quotes present but no dance troupe dressed as toasters - disappointing." Thus spake @james_day_metro. Collective deja vu descended on the press room with the announcement of Samsung's Evernote-friendly fridge (which, you'll notice, we haven't covered). Said @tomroyal, to rapturous retweets: "It isn't officially CES until some berk relaunches the internet fridge. Again." Qualcomm press conference attendees were in for more of a show. Noted processor fans Maroon 5 and, er, Big Bird were there to help launch the Snapdragon 800 and 600 processors. It was a comedy of fails for those watching the live stream though. @thedextriarchy summed it up succinctly: "Qualcomm hires Maroon 5 but doesn't license the streaming rights. Dubs it over with Dido. Then CUTS THE STREAM." At that point, people watching the livestream should have been grateful for small mercies. Big Bird aside, what it all adds up to is a fairly tedious show for tech fans. 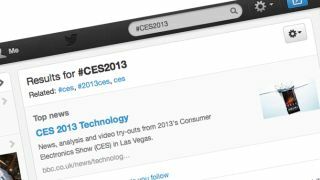 "Four years ago today Palm launched the Pre at CES, arguably last really anticipated or interesting CES announcement," proclaimed tech pundit @gartenberg. That's partly why Buzzfeed didn't even bother showing up - we assume, we clicked through from @mattbuchanan's tantalising "Why we didn't go to CES this year even though I miss you all very much" tweet but, would you believe it, there wasn't a single cat or picture of Ryan Gosling in sight so we had to shut the tab. 2. A technologically superior fork - because apparently this is all the tech world has left to offer us. Dismay from @alexismadrigal: "The fork that keeps you from eating. And generates data. Yes, fork." Disgruntlement from @lizjmercer: "Can't think of anything worse than a fork that gets pissy if it thinks you're eating too fast. #judgementalcutlery"
Disingenuous book plugging from @Lord_Sugar: "Sounds like this digital fork idea is based on 'The Tiny Fork Diet' in my latest book..."
And that's just a small flavour of CES so far. All you need to add is some serious jet lag, about six miles of walking a day and a lot of alcohol. You can get through it with a hip flask of children's tears and a lycra one-piece body stocking - at least, that's what @c_davies tells us.